Thursday saw another mixed bag of weather, with some folks seeing heavy rainfall and others seeing not much of anything. We should replay that program today before better odds of rain and storms return this weekend. Expect at least a handful of showers and thunderstorms today. Not everyone will get rain, but those that do could see some heavier downpours. In terms of coverage, it will probably be similar to or less than what we saw yesterday, with the best chances the closer you get to the coast. Today probably carries the lowest rain chances of the next several days. Temperatures will range from the upper-80s where you see showers to the low-90s further inland with drier weather more likely. We’ll see another disturbance about 20,000 feet up migrate toward us this weekend. What does that mean? It means gradually increasing rain and storm chances again. Saturday shouldn’t be a washout, but there will be a few more showers and storms than we saw yesterday and will see today. Sunday may be when the more widespread showers and storms impact us. Some of the rain on Sunday could be locally heavy. Additional widely scattered showers and storms will remain with us for Labor Day. Best course of action this weekend? Have a rain plan ready to implement if you’ve got any outdoor activities. In some cases, you won’t need to use it, but given the erratic nature of rainfall in these setups, it would be good to have a plan to turn to. 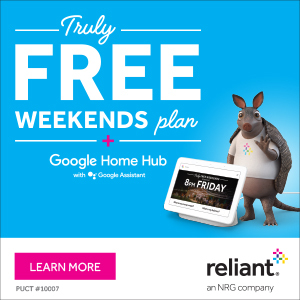 We don’t expect any serious flooding this weekend, but as is almost always the case in Southeast Texas storm setups, locally heavy rainfall could lead to brief, localized street flooding in areas of poor drainage. Also worth noting, the tropical thunderstorms this weekend could be capable of producing funnel clouds or brief waterspouts, especially in the morning near the coast. Just something to keep in mind if you’ll be at the beach this weekend. Expect temperatures in the upper-80s most days, with low 90s inland if rainfall doesn’t materialize quite as much as anticipated. Some parts of the greater Houston region received heavy showers on Wednesday, with several readers reporting upwards of 3 inches of rainfall in an hour. Other areas within the metro area saw no rain at all, just distant lightning. Rain coverage should back off a little bit today and Friday before more widespread showers likely return this weekend. As moisture moves into the Gulf, this pattern should continue. Some slightly drier air has moved into the atmosphere, and this may help dampen—oops, wrong word there, I should probably say reduce—shower chances for the next two days. That is not to say it won’t rain, but rather that instead of 50 to 60 percent rain chances, it probably will be more like 30 to 40 percent, with the lower likelihoods inland, and slightly better chances near the coast. Highs will depend on local conditions, but will probably range from 90 to 95 degrees. 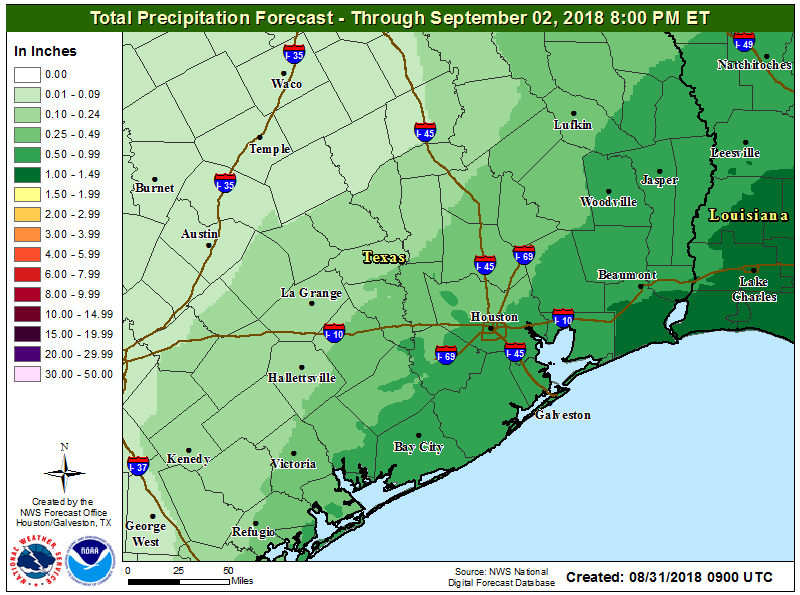 By Saturday, the pattern will begin to shift toward wetter weather again, a the upper air pattern again favors the movement of more moisture into the Texas coast. Saturday doesn’t appear to be too waterlogged at this point, and it should be at least partly sunny. However, especially during the afternoon hours, there probably will be a healthy amount of showers and thunderstorms popping up across the Houston area. Highs in the low 90s. Houston remains in a wetter, slightly cooler pattern that will see up-and-down rain chances through the Labor Day weekend. As we near the heart of hurricane season we’re continuing to expect activity to ramp up in the tropics, including possibly the Gulf of Mexico, but see no specific threats at this time. We’ll discuss that a bit more below. 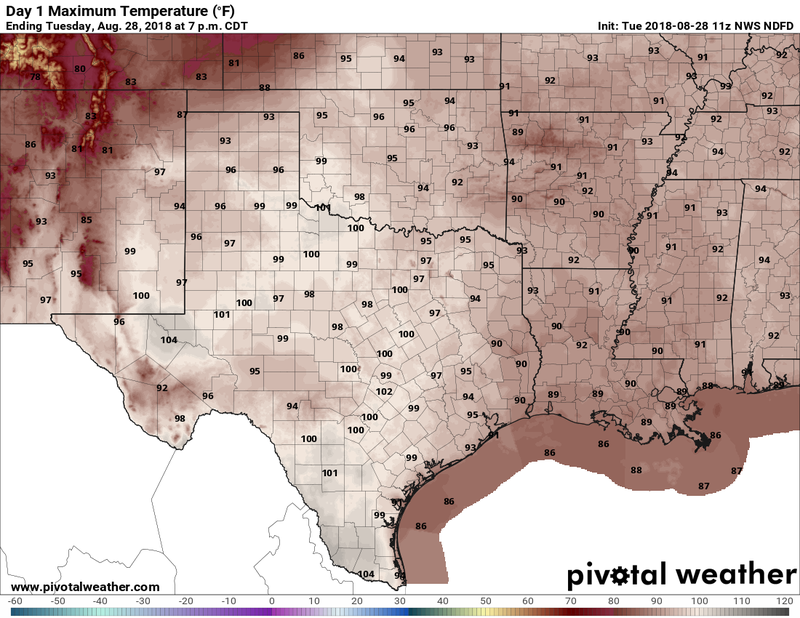 Lower pressure draped over the region today, combined with moisture from the Gulf of Mexico, should induce some pretty healthy rain chances for Houston (probably around 50 percent), especially during the afternoon hours. Because of some unstable air, where thunderstorms form, they could become severe, bringing the threat of strong wind gusts and lots of lightning. Some slow moving thunderstorms could quickly dump and inch of rain, or so. 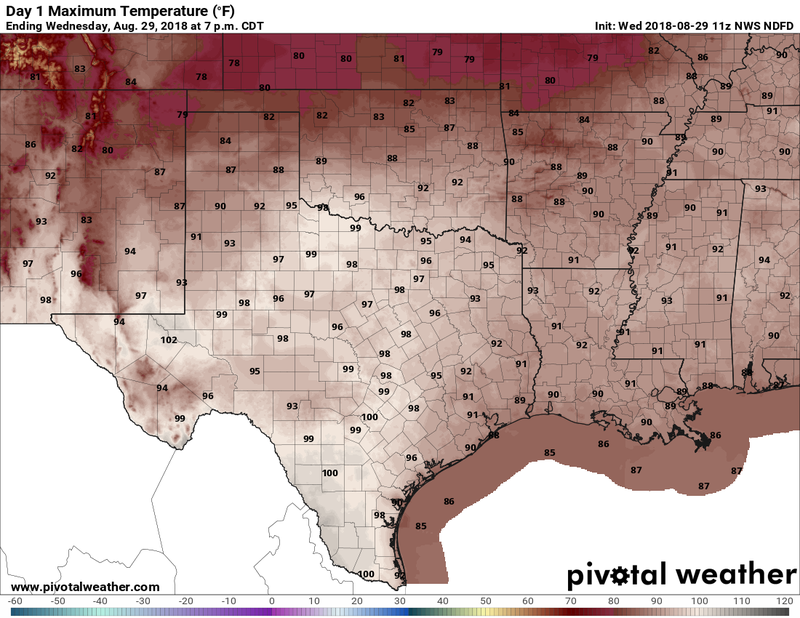 Highs will depend upon localized conditions, and should vary from the upper-80s to mid-90s. Rain chances fall back a bit, especially for inland areas. I still think coastal counties and the southern half of Harris County will see 40 or 50 percent rain chances, but they will be lower for other areas. Partly sunny skies should allow high temperatures for most areas to push into the mid-90s. Our weather pattern heading into the end of August and early September has definitely changed, as high pressure has shifted east, and opened up the Texas coast to moisture from the Gulf of Mexico. While we don’t see any tropical threats at this time, certainly we can expect to see some elevated rain chances and (for August) cooler temperatures for most of the rest of this week, and Labor Day weekend. Temperatures today will depend upon cloud cover, likely ranging from about 90 degrees into the mid- or even upper 90s for far inland areas that see mostly sunshine. Overall rain chances will be pretty healthy, about 50 percent. 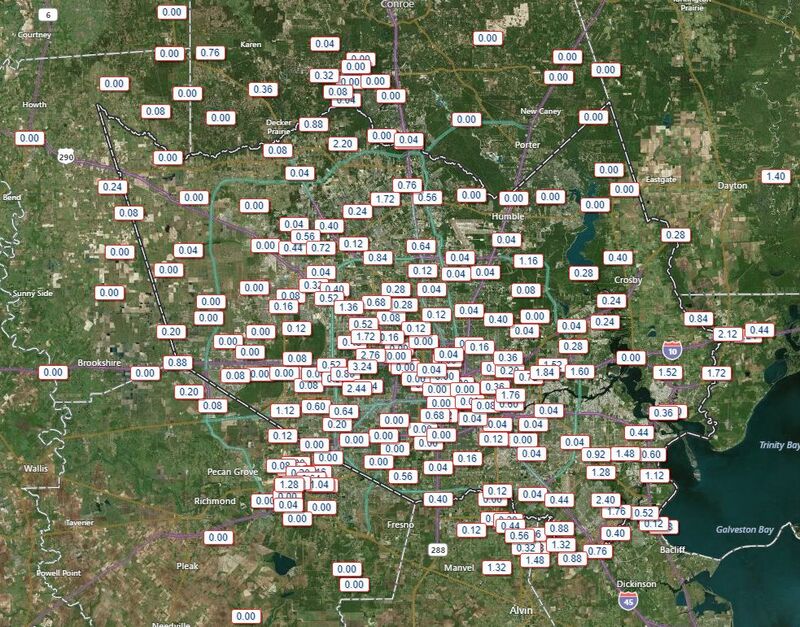 In this pattern, one neighborhood may receive as much as half an inch, while the next neighborhood over gets some sprinkles, and the next neighborhood after that gets no rain at all. Flooding won’t be a concern, but the National Weather Service does warn that scattered showers and thunderstorms today may produce short-lived tropical funnels and waterspouts. This pattern should more or less hold for the rest of the work week, with partly sunny days, scattered showers and thunderstorms, and high temperatures between 90 and 95 degrees. For the most part, outdoor activities should be fine, but if you do see a thunderstorm moving in you most definitely should take cover due to the potential for lightning.